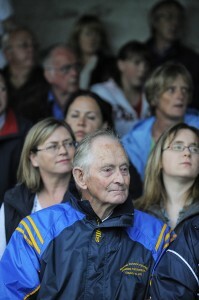 Henry Neylon, president of the Michael Cusack’s Club looks on during the Clare GAA 125 anniversary match in Carron in July 2009. Photograph by John Kelly. In July of 2012, I spoke with Henry as he celebrated his 90th birthday and a week before his beloved Ml. Cusacks club held a functon to mark the 50th anniversary of the North Clare club. A week earlier the club’s junior team had captured the Clare division 4 football league title. 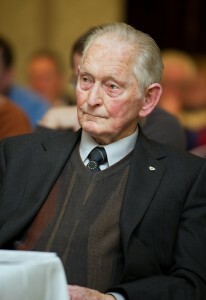 Henry spoke passionately about his beloved club and about a lifetime of involvement in the GAA. He played for Carron in 1944 when they won the junior novice title, beating Moveen in the final. Two years later the club was known as BellHarbour and he was a member of the team which beat Caherea in the junior championship in Miltown. “We had no field of our own then. We trained in our own areas and only met up on match days”, he recalled. “Padraig Begley drove us to the games and Fr. Corry refereed the final. There were a few years after that when we didn’t have a team in the parish and a few of us played with Kilfenora”, Hendy explained. 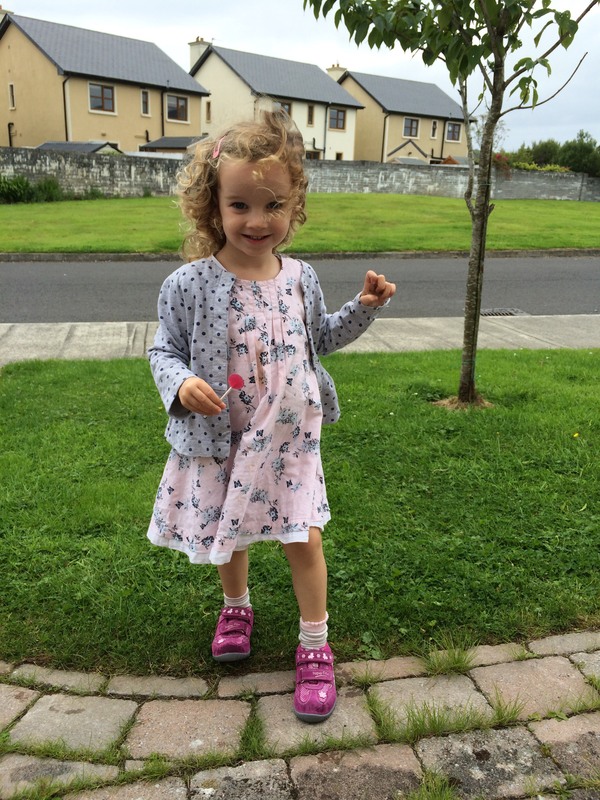 Living a short distance from the village of Kilfenora, he went to school there. “There was no organised schools football then but we would play football at every opportunity”, he said while acknowledging that there has been a great rivalry between Cusacks and Kilfenora over the years. Henry Neylon of Michael Cusack’s, on the night of his election as Clare GAA President, at the Clare GAA annual convention in the Auburn Lodge Hotel, Ennis in December 2012. Photograph by John Kelly. He has held a variety of positions within Clare GAA including acting as a county minor selector. He served as an umpire at a number of county football finals in the sixties and seventies. “The County board appointed the umpires just as they appointed the referees”, he recalled. He was a member of the county board for many years as his club’s delegate and he attended county convention for over fifty years. 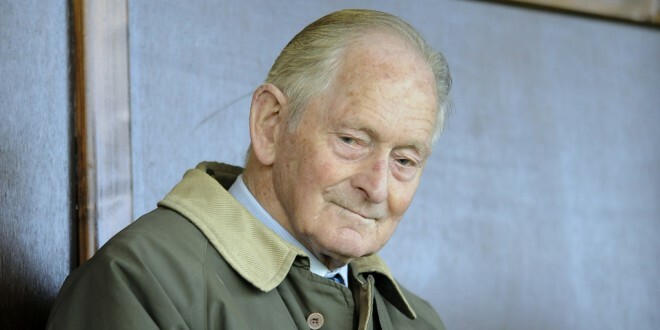 He attended All-Ireland football finals for over fifty years having attended his first in 1946 recalling “Roscommon were six points up and people were leaving the grounds. Then Kerry struck for two goals”. There are many highlights, mostly in relation to the growth of his club. “Developing our own pitch at Gleann Ciosog was special”, said the man who served as club treasurer at the time. “Hosting the county final in 1984 and having the launch of the GAA centenary celebrations in Carron made us all very proud”. He was also very proud of his part in the restoration of the Cusack homestead. He was one of the project’s trustees. Having served as a selector at every level in the club, its not surprising that he had special memories of a number of great successes over the years. “Our under 14 A success in 1971 when we beat Kilrush was special. Their officials said that they would not pass Miltown to play us. I succeeded in getting agreement for a toss and won the toss to get the game to Lahinch”, he recalled. Another special occasion was the winning of the minor A championship in 1976 when his North Clare amalgamation beat a fancied Kilkee outfit that included Noel Roche. The winning of the intermediate title in 1983 when they beat their neighbours and great rivals Kilfenora was another highlight for the late Henry. Winning the junior championship in the first year that the club was formed in 1962 was also a highlight. Four years later (1966) they knocked the then defending Clare senior champions Cooraclare out of the title race. “We started that game with thirteen players because some players got held up on the way to the game but we had fifteen before half time. It was a great victory. We were beaten by Kilrush by a point in the semi-final”, he recalled. Another source of great pride for the Ml. Cusacks President was the selection of fellow club members on county teams. “We have provided some great players to the county, players like Peter Davenport, Don O’Loughlin, Mattie McMahon, Kieran McGann and Michael Quinn. While he took a special interest in the progress of football teams representing his club and Clare, he was also a great follower of Clare hurling. He saw Clare win the Oireachtas title in 1954 and, of course, he was thrilled when Clare made the breakthrough to win Munster and All-Ireland senior honours in 1995, a feat they repeated in 1997. He was in the Gaelic grounds in Limerick when Clare beat Kerry in the Munster football final in 1992. Henry Nealon’s name is synonymous with North Clare football and, especially, with the Ml. Cusacks club. The club has had its ups and downs over the past fifty years but it has survived with Henry a major driving force.